That’s why we commissioned Forrester Consulting to conduct a study using their proven Total Economic Impact (TEI) methodology to demonstrate how brands can use Movable Ink’s visual experience platform to drive business goals – and, spoiler alert – we’re thrilled with the results. Download your copy of the Forrester TEI study here. According to the Forrester TEI study, email campaigns with creative personalized by Movable Ink performed dramatically better. Forrester’s composite organization based on multiple client interviews saw a 15% lift in CTR in year 1 using Movable Ink. With the addition of more sophisticated, data-driven campaigns, the organization saw lifts of 25% CTR in year 2 and 40% lifts in CTR in year 3. Forrester also found that organizations using Movable Ink could generate a total revenue lift of $66 million over the course of 3 years. It’s no secret that Movable Ink helps brands streamline their production process, making it easier to create unique visual experiences at scale. Forrester noted in their study that without Movable Ink, the composite organization would take a substantial amount of time building countless creative variations manually. Once Movable Ink was introduced, the organization could automatically generate personalized content in real-time from various data sources, resulting in 40% less effort to create campaigns. Forrester noted that Movable Ink’s real-time optimization capabilities help brands test creative on the fly, resulting in a streamlined testing process and better 1:1 customer experiences. One director of email said, “We can put out a few different variations that we want to test and optimize in real time. This minimizes the potential business impact of not selecting the best campaign for that particular day.” And, according to Forrester’s research, those improved personalized experiences make customers feel valued and appreciated, giving brands the opportunity to drive long-term customer loyalty. Movable Ink’s visual experience platform helps leading brands reach their business goals. We’re talking about increased ROI, streamlined production, and the power to stay innovative. 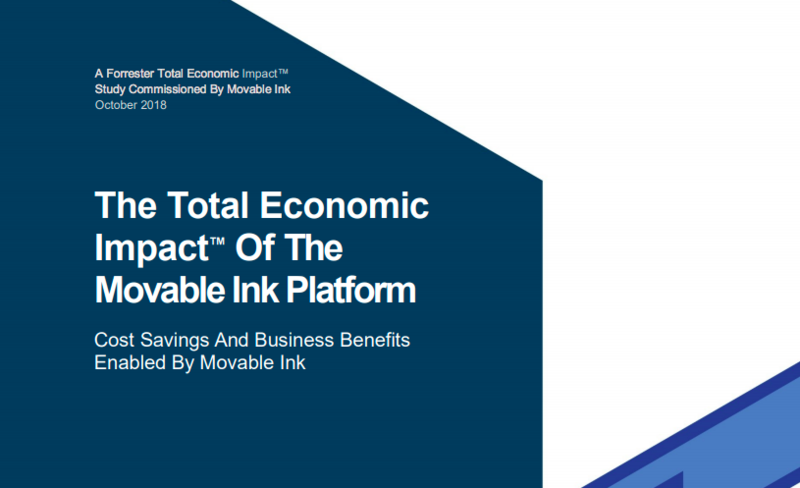 Download the Total Economic Impact of the Movable Ink Platform to find our what Movable Ink can do for you. This entry was posted in Content Marketing and tagged Forrester on November 14, 2018 by Kristen Dunleavy.